If you told me a year ago when I started this job at Trapology Boston that I would be in a basement with Chris Evans pranking people, I’d tell you that you were crazy. It started off with a casual conversation between management about possibly working with a celebrity for a prank to help support a charity. We loved the idea of building something off site to put our skills to the test and for a good cause. 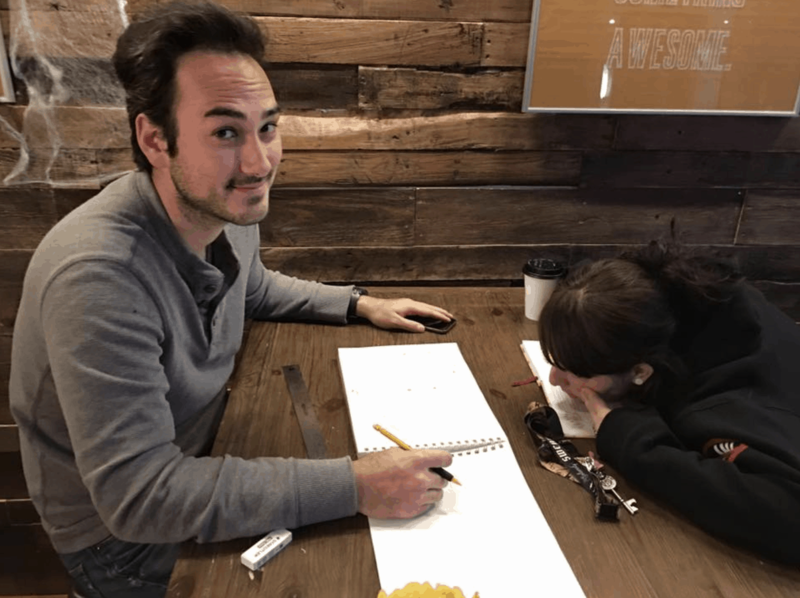 Flash forward to mid-October and Nicole, Jason and myself [Tina] are staring at each other in silence with sketch books, rulers, pencils and a notebook filled with crazy ideas spread across the table. Jason and Nicole went through what I assume was 100 different game designs and puzzles before they even told me what was happening. After playing a game of chance with our staff to figure out who was going to be the fourth person to help us get this project done, we had about 10,000 ideas. With our brains full of ideas and puzzles, we set off to scope out the potential location for the event. 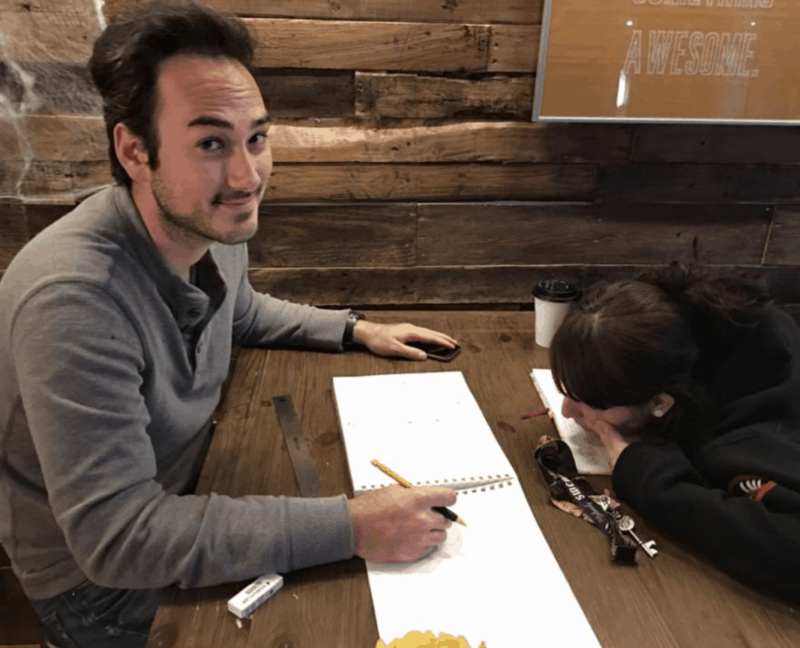 We measured, we sketched, we looked strange talking about hidden doors and hiding cameras. Remember all those 10,000 ideas I told you about before? Forget about them because it gets narrowed down to about five puzzles total. For prank videos, the puzzles must “read” well on camera and be engaging enough to keep the unsuspecting players progressing to the end. Our ideas of multi-stepped puzzles, decoders, and other logic based ideas were just a litttttle too much for what we needed to convey. I remember our staff all packed into the mini-van coming back from playing another escape game together (we like to take team trips to play other rooms because we are also addicted to them on top of running them). Jason and Nicole dropped us off at Trapology and I was eating pizza with the staff (it’s was an extra cheese from New York Pizza, it was delicious) when we got the e-mail about the location change. Now, five days before the event is scheduled to run we have to change everything. Jason came back to Trapology to pick me up and head over to Somerville. ComiCazi is a dream world for all comic book lovers, it was packed to the brim with so much cool stuff.If you love comics, I suggest checking that place out. Our team was scouring around, discussing logistics and where to put all the puzzles. Things seemed to flow together nicely and we were happy with our final design! Jason and I had a phone meeting with Omaze, while sitting inside his tiny car at 10pm. After that meeting, everything was ready to be built. Now to keep the element of surprise, we couldn’t do our build out until the night before. No pressure, right? Wrong. The pressure felt pretty high for us. We wanted everything to be perfect for this event. Not only do we love when players enjoy our games, but this was also going to support Christopher’s Haven. If you don’t know, Christopher’s Haven is a non-profit that provides housing for families with children who are battling cancer. There is no way we were going to let any of our build out disappoint. The days leading up to the prank were filled with a lot of running around. I’d like to take a moment to give a shout out to our Trapology Staff: Pam, Nate, Carolina, Amelia, and Sledder who held down the shop while Jason, Nicole, Micha, and myself were running around like madmen. We weren’t allowed to tell them who the celebrity was, which inspired them to make a crazy wall complete with red yarn, notes, and a lot of thumbtacks. They were our little rays of sunshine when we were feeling defeated. We spend hours upon hours ordering, moving, building, stress-eating, testing, destroying, re-building, and not sleeping. This brings us to Friday morning, 24 hours before the event. We planned to drop our stuff off at ComiCazi and start working on set up in the basement. After picking up Micha, we were ready to head over, until Jason and Nicole called us because their car died and was in the process of waiting for a tow truck in Chinatown. We tried not to take this as a bad omen. Micha and I picked up Jason and all of the equipment from the broken down car in Chinatown and left Nicole there to wait for AAA… in the rain. We got to ComiCazi to meet with the Omaze team and run through everything. After enjoying some burritos and bubble tea, we ran back to Trapology to pick up some more stuff to begin the final build out. The night arrives and we’re ready to get down to business in the comic book store. Our behind the scenes video at the bottom of the post will show you the insanity that took place. You can think you plan for everything that could possibly go wrong, but you never can. No matter how many obstacles we hit, we were able to overcome them. Around 2am, we were as confident as could be with our build out. We headed home to sleep as much as we possibly could (it was 5 hours). The morning of the event our emotions were pretty mellow, because we are not morning people and being up this early was foreign to us. Top it all off, we were sleep-deprived, and still weren’t completely finished with our cameras, audio, and other special effect tech. Once we got to ComiCazi, things started to heat up and we were ready to rock and roll! After a several quick partial run throughs of the game, we were as cool as a cucumber! Chris Evans showed up and we were able to get things rolling. A quick personal side note, you may think you can be prepared for Captain America to stroll into a room, but you can’t. I kept it together by slapping Micha’s leg a couple times. After that I was totally cool and Micha had a bruise. We gave Chris a run through of how things work, and he was ready for his career as a game master. He’s ridiculously hilarious and watching him run a game and guide people through the puzzles was an experience we’ll never forget. It was really fun for us to watch everyone go through our puzzles and get scared by Chris at the end. 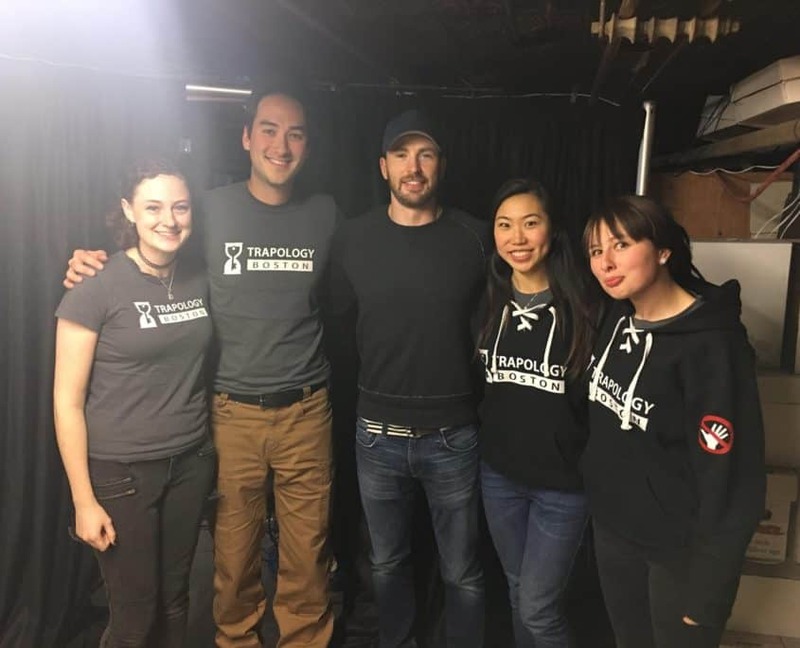 While it was incredible to meet someone like Chris Evans, underneath it all, we were all very grateful to be able to work on something so meaningful. This video will draw so much attention to Christopher’s Haven, and that’s the most important part of all. 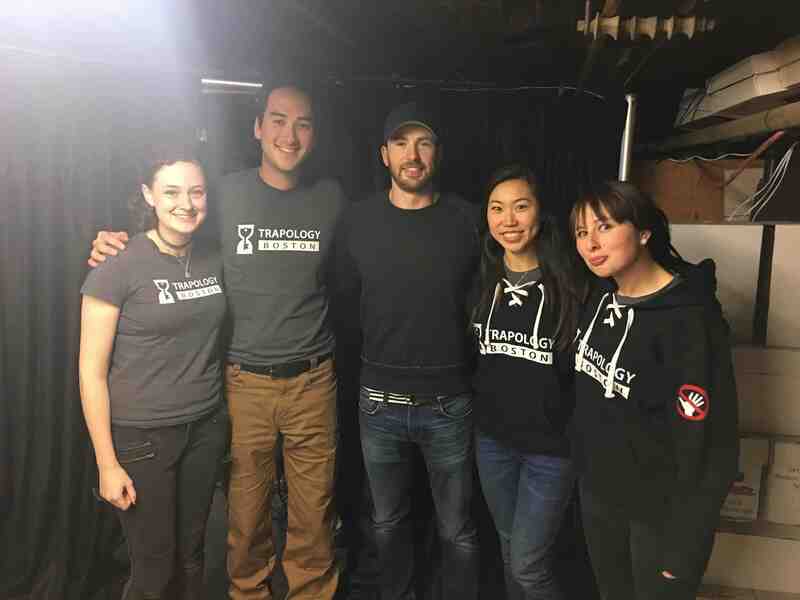 We’d like to thank Omaze for letting us work on this project and Chris Evans for being such a great game master! Enjoy our behind the scenes video, and please consider supporting Christopher’s Haven!!! Use the code TRAPOLOGY to get an additional 100 free entries!